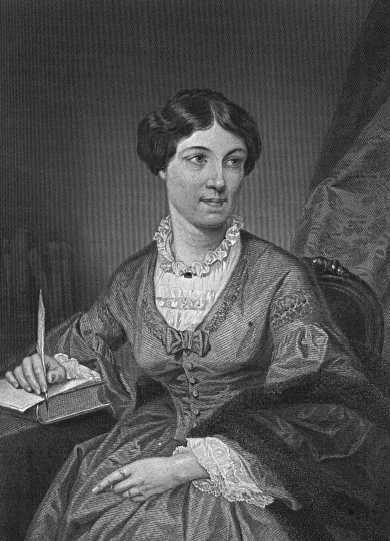 In 1834, Harriet Martineau set out upon a grand adventure throughout America and recorded her thoughts in a journal, parts of which are interesting from a material culture and a culinary point of view. Of Montgomery, and what she saw traveling on to Mobile and New Orleans, her description was similar to that of Philip Henry Gosse who wrote of his surroundings in nearby Pleasant Hill, AL in roughly the same time period. (see previous post). Harriet did not give the names of any of the people she stayed with in Alabama and while we know she travelled through Creek Territory to get to Montgomery, we do not know in which direction her final destination lay, only that it was seven miles outside what was then the town limit. I would have enjoyed retracing her footsteps as we did Gosse, had she left any indication of where the plantation was or who the family was that owned it. Like Gosse, she wrote of the dog-trot houses and cabins although she did not use that particular term when describing the homes in the area. The friends she went to visit outside of Montgomery were about to build a “good house”, yet during her visit their abode, like their neighbors, was, “a log-house, with the usual open passage in the middle. Roses and honeysuckles, to which humming-birds resort, grew before the door. Abundance of books and handsome furniture and plate were within the house, while daylight was to be seen through its walls. In my well-furnished chamber, I could see the stars through the chinks between the logs.” Perhaps enamored with the color of the blooms and their heady fragrance, she found the log dog-trot “delightful”, and said, “During the summer, I should be sorry to change this primitive kind of abode for a better”. She spoke of those who chose to camp in their wagons and prepare their own meals rather than pay for lodging and poor fare. In her case the hotel in Montgomery had been alerted to her arrival, yet when she arrived at just past eleven in the evening her room wasn’t ready until around 1 a.m. Although peaceful, she encountered Creek Indians as she traveled through their territory, some overcome with what their friends termed, “whiskey too much”. The roads were bad, but the scenery and the blooms from various plants beautiful. As they started up a hill into Montgomery in the coach, the men, as was customary, disembarked and walked behind the coach. She was not complementary as to the habits of the Alabamians, speaking of numerous murders and duels she was told occurred almost daily, the deplorable lack of education found amongst the planters and their children, and the debilitating backwardness that naturally resulted from being unexposed to the social graces found in less isolated surroundings. Harriet found Columbus, GA more pleasing than Alabama and wrote in her journal about the rather substantial breakfast she ate in the hotel in Columbus before going on to Montgomery. She had tea, coffee, cornbread, buns, buck-wheat cakes, broiled chicken, bacon, eggs, rice, hominy, fish, fresh and pickled, and beef-steak. She visited friends on a plantation near Montgomery and commented on how it was provisioned saying most articles of food were provided on the plantation. “Wine and groceries are obtained from Mobile or New Orleans, and clothing and furniture from the North”. She described the kitchen-garden in which peas were ripening and strawberries were turning red in the middle of April. “We had salads, young asparagus, and radishes”. She observed the routine fare of the daily meals saying except for what vegetables were in season, the meal plan varied little. Breakfast was served at 7 a.m. and consisted of, “hot wheat bread, generally sour, cornbread, biscuits, waffles, hominy, dozens of eggs, broiled ham, beef-steak, or broiled fowl, tea and coffee. What she called lunch, cake and wine or liqueur, was served at 11:00. The main meal of the day, she termed dinner, was at 2 p.m. and was usually, “now and then soup (not good), always roast turkey and ham, a boiled fowl…a tongue…a small piece of nondescript meat, which generally turns out to be pork disguised; hominy, rice, hot cornbread, sweet potatoes, potatoes mashed with spice, very hot; salad and radishes, and an extraordinary variety of pickles. Of these, you are asked to eat everything with everything else. If you have turkey and ham on your plate, you are requested to add tongue, pork, hominy, and pickles. Then succeed pies of apple, squash, and pumpkin, custard, and a variety of preserves as extraordinary as the preceding pickles: pineapple, peach, limes, ginger, guava jelly, cocoa-nut, and every sort of plums. These are almost all from the West Indies. 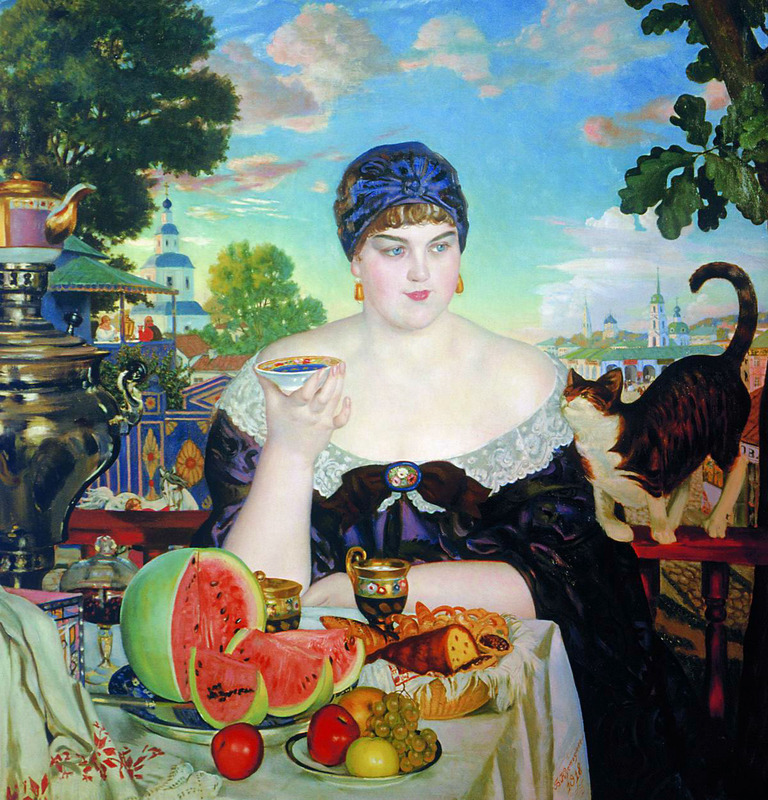 Dispersed about the table are shell almonds, raisins, hickory and other nuts; and to crown the whole large blocks of ice cream. Champagne is abundant, and cider frequent. Ale and porter may now and then be seen, but claret is the most common drink”. Having ice cream in April means that the plantations had ice houses in which ice was stored. After being cut in blocks during the winter freeze, it was tightly packed in layers of sawdust and hay for use as long as it lasted. The last meal of the day, Supper, was taken at about six or seven in the evening, sometimes at the table, but more often trays were passed around and participants balanced their plates on their laps. “Then follow tea, coffee, sliced ham or hung-beef, and sweet cake”. 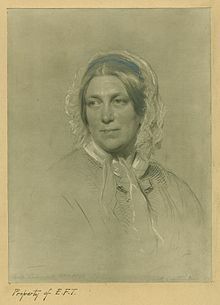 NOTE: Harriet Martineau, 1802-1876 was of French Huguenot lineage, born in England, and was a celebrated writer who supported herself and her family through her writing after her father’s business failed. During her visit to the U.S. she visited with no less than Dolly and James Madison, the former President, at their home. – Martineau, Harriet. Society in America. Pub. 1837. Paris. Maize grew better in Lower Louisiana than in French Canada, although it wasn’t unknown in the latter. Paul le Jeune, Jesuit missionary, did comment on the Montagnais Indians northeast of Quebec making sagamite made from bled d’Inde, or maize. Francois-Rene Chateaubriand described sagamite as, “a sort of paste, made of Indian corn”, while another writer evidently was more impressed saying it contained corn meal, pork or bear meat, and beans flavored with salt or sugar. – Atala: Or, The Love and Constancy of Two Savages in the Desert. 1814. Boston. First trans. 1802. 2. Bulletin, I 144. New York State Museum. Nov. 1910. NY. Some writers, including the Jesuits in North America, described it either as a thin pottage or as a thicker stew, one going so far as to compare it to wallpaper paste. – Parkman, Francis. The Jesuits in North America in the Seventeenth Century. 1867. Boston. Succotash was a mixture of green corn and beans, sometimes with the addition of other tidbits, cooked into a mush that in some instances may have been similar to sagamite. Even those who like cornbread will admit that the texture is much coarser than wheat bread, even whole wheat bread, and it was that texture the French women objected to. At some point, it was discovered that the finer the corn was ground for the meal the softer the loaf, and if the meal was slowly boiled into a mush before being mixed with a third the amount of wheat flour, yeast, and other ingredients it produced a much better bread. – The Farmer’s Magazine. April 1858. Shannon Lee Dawdy reported on an archaeological survey saying that maize was found at all of the early French colonial sites that have thus far been analyzed. That seems to indicate that the lower classes probably ate it regularly and I suspect fared much better than they had in France. Le Page du Pratz commented on maize consumption by the French. 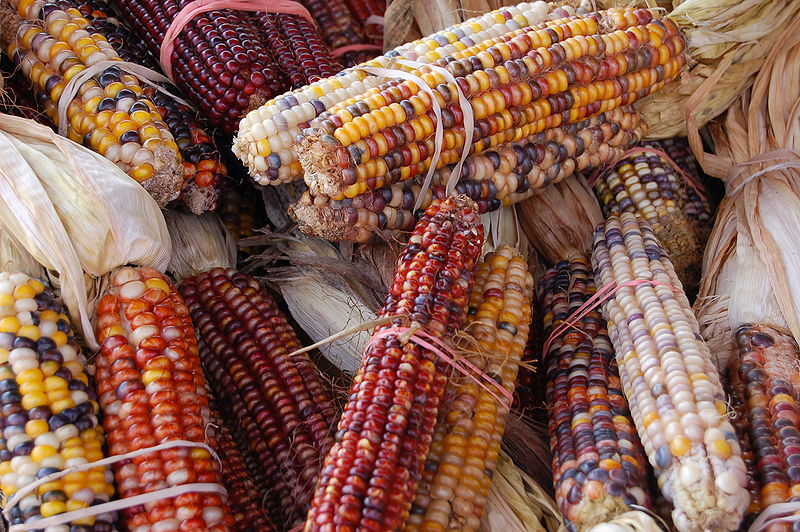 The parched meal is the best preparation of this corn; the French like it extremely well, no less than the Indians themselves: I can affirm that it is a very good food…it is refreshing and extremely nourishing. Marie Madeleine Hachard, a nun in New Orleans, noted eating sagamite, saying, “we eat it often [rice] along with sagamite, which is made from Indian corn that has been ground in a mortar and then boiled in water with butter or bacon fat. Everyone in Louisiana considers this an excellent dish”. Dumont wrote of colonial bread made from maize and cooked rice. He wrote of a mixture of corn and French flour, approximately half of each, when wheat was available to mix with the maize meal. John Reynolds did document the French in Illinois cultivating maize. “I presume for more than one hundred years the French plowed in their corn about the 1st of June, and turned under the weeds and not many grew until the corn was up out of the reach of them. They planted the seed corn in the furrows as they broke the ground, and turned the furrow on the corn planted; plowed a few furrows more and planted another row of corn; and so on, until the field was all planted”. – Agricultural Resources of Southern Illinois. Reprinted from Transactions of the Illinois State Agricultural Soc. 1856-57. Although this has been a brief look at maize and its uses in colonial Louisiana, it will prove useful information in interpreting the foodways of the French and natives at Ft. Toulouse and provide information interested visitors can look into afterward. Persimmons are native to North America, and grew in the poorest of soils making them much appreciated by natives and European settlers alike. They were used in a variety of ways, some of which we’ll touch on here as I continue to explore foods that were available at Ft. Toulouse between the years 1717 and 1760. 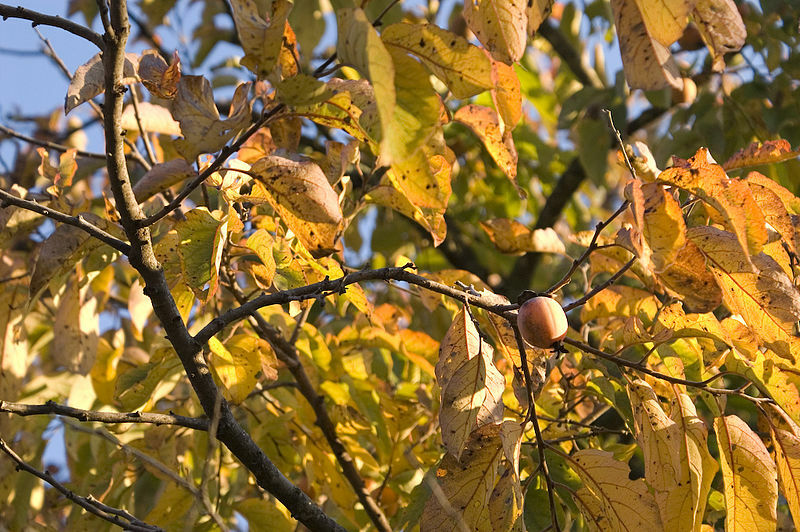 The persimmon was described as growing wild, “about as large as the biggest Orleans plum, of a bright scarlet colour, with four or five very hard seeds in each, nearly of the size and shape of those of tamarinds, and the pulp of the fruit, when perfectly ripe, is of a sharp, but luscious sweetness”. Fermented drink was important to the Europeans and probably the natives in the area. In some places, where apples and cyder are scarce, the inhabitants gather the persimmons, after they are perfectly ripe, knead them into a kind of dough, or paste, with wheat bran, which they form into loaves, and bake in ovens: of these they brew a fermented liquor, which is called persimmon beer. This serves for their common drink, and is tolerably pleasant and wholesome. It is sometimes, though rarely, distilled into brandy. – Smyth, John Ferdinand Dalziel. A Tour in the United States of America. 1784. London. The French in Louisiana were well acquainted with persimmons which they called Placminier. “When it is quite ripe the natives make bread of it, which they keep from year to year…The natives, in order to make this bread squeeze the fruit over fine sieves to separate the pulp from the skin and the kernels. Of this pulp, which is like paste or thick pap, they make cakes about a foot and a half long, a foot broad, and a finger’s breadth in thickness: these they dry in an oven, upon gridirons, or else in the sun: which last method of drying gives a greater relish to the bread. This is one of their articles of traffick with the French”. – du Pratz, Le Page. The History of Louisiana. 1774. London. As with many foods of earlier centuries, persimmons were inexpensive, free, in fact, but labor intensive to prepare. Martha McCulloch-Williams noted one needed, “the patience of Job to free the pulp properly from skin and seed”. I have found the best way to do that is to bring them to a simmer in just enough water to keep them from sticking to the pot and allowing them to simmer for 10 or 15 minutes before putting them through a colander to separate the pulp from the seeds and skins. – Dishes and Beverages of the Old South. 1913. NY. Now that we’ve documented their use by both natives and French and briefly discussed how to extract the pulp from the seeds and skins, let’s look at what we can do with that pulp. PERSIMMON PUDDING: The Rural Carolinian. Oct. 1871. Pick over, rejecting the unripe ones. Force through a sieve in order to separate from the seeds. Add a little sugar and flavor to your taste. Place in pans and bake quickly. When done, grate some loaf sugar over them and put back to brown. PERSIMMON CAKE: Proceedings. American Promological Soc. 1914. 1 cup persimmon pulp, ½ cup sugar, 1 egg, butter the size of a walnut, 1 c. of flour, 1 tsp. baking powder, ½ teaspoon soda. Bake 40 minutes in a moderate oven. For a soft pudding, leave out the egg. For a custard leave out the flour and baking powder. PERSIMMON BREAD. 1 cup persimmon pulp, 1 cup water, ½ teaspoon soda, yeast, shortening, flour to make a stiff dough. Set to raise, mould, and bake as other bread. PERSIMMON PUDDING. 1 pint pulp, 1 cup sugar, 1 quart of sweet milk, 3 teacups flour, 1 teaspoon cinnamon, 2 teaspoons baking powder. Bake in a moderately hot oven for an hour, or until it is nicely browned. Cool and serve with whipped cream. The fruit used for this purpose should be of superior quality and perfectly ripe before using. – Troop, James. The American Persimmon. April 1896. Lafayette, Ind. PERSIMMON JAM. Miss Leslie’s New Cookery Book. 1857. Do not gather persimmons till late in the fall, when they are well sweetened with the frost. They are unfit to eat till all the leaves are off the trees, and till they are ripe enough to mash. Then pack them in jars with plenty of brown sugar. Maple sugar will do. In the back-woods they will be valued. When cooked they will be improved by the addition of a little sweet cider. I shall not undertake to describe all the kinds of grapes which this country produces; it is even impossible to know them all; I shall only speak of three or four. The first sort that I will mention does not perhaps deserve the name of a grape, although its wood and its leaf greatly resemble the vine. This shrub bears no bunches, and you hardly ever see upon it above two grapes together. The grape in substance and colour is very like a violet damask plum, and its stone, which is always single, greatly resembles a nut. Though not very relishing, it has not however that disagreeable sharpness of the grape that grows in the neighbourhood of New Orleans. On the edge of the savannahs or meadows we meet with a grape, the shoots of which resemble those of the Burgundy grape. They make from this a tolerable good wine, if they take care to expose it to the sun in summer, and to the cold in winter. I have made this experiment myself, and must say that I never could turn it into vinegar. There is another kind of grape which I make no difficulty of classing with the grapes of Corinth, commonly called currants. It resembles in the wood, the leaf, the tree, the size, and sweetness. Its tartness is owing to its being prevented from ripening by the thick shade of the large trees to which it twines. If it were planted and cultivated in an open field, I make not the least doubt but it would equal the grape of Corinth, with which I class it. Muscadine grapes, of an amber colour, of a very good kind, and very sweet have been found upon declivities of a good exposure, even so far north as the latitude of 31 degrees. There is the greatest probability that they might make excellent wine of these, as it cannot be doubted but the grapes might be brought to great perfection in this country, since in the moist soil of New Orleans, the cuttings of the grape which some of the inhabitants of that city brought from France, have succeeded extremely well, and afforded good wine. Du Pratz wrote of two boys breaking twigs from muscadine vines planted in New Orleans and severely damaging the new plants. The father pruned the twigs, and the vines recuperated, pushed out new shoots and even put on another bunch of grapes. Du Pratz, Le Page. The History of Louisiana: Or of the Western Parts of Virginia and Carolina. 1774. London. The first area of North Carolina to be settled by Europeans was Albemarle, it extended from the coast to the border with Virginia. The settlement at Roanoke collapsed by the 1580’s and some time around 1600 Virginians began to drift back toward North Carolina. 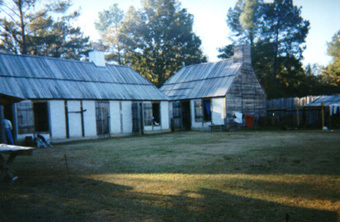 French Huguenots were among those who moved into Carolina. The Cape Fear River was settled in the 1720’s by settlers from other colonies and by newly arrived Europeans. By the 1730’s Welsh and Scotch-Irish arrived in the area. The first Scots began arriving in the area in 1739 when some 350 people from Argyllshire stepped off the ship. My own family was probably among them (McDougal, Morrison, Killen, Armstrong, and Campbell). I know they had settled there by 1750, and as they came from Argyllshire, I suspect had arrived much earlier. They settled on the Upper Cape Fear near present-day Fayetteville and Cumberland. The area was rich in native foods and very quickly was also sown in whatever the Europeans brought over from their native home land. The Europeans learned to prepare the New World foods in the manner of their native neighbors or sometimes prepared them similar to whatever they resembled that they were familiar with. 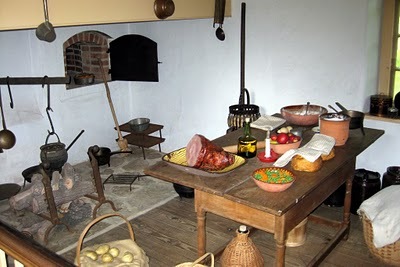 Food was probably more varied and more plentiful in Colonial America than most of the colonists had known in the old countries. The following list for North Carolina is from: Stevens, J., editor. A New Collection of Voyages and Travels. 1711. London. It seems difficult to locate a pure variety of the actual native North American grape today, due in part to there being such a discrepancy in how people referred to them, the white often called scuppernong, and the deep purple variety often called muscadine. The fact is, they’re all muscadines, the purple and the bronze. 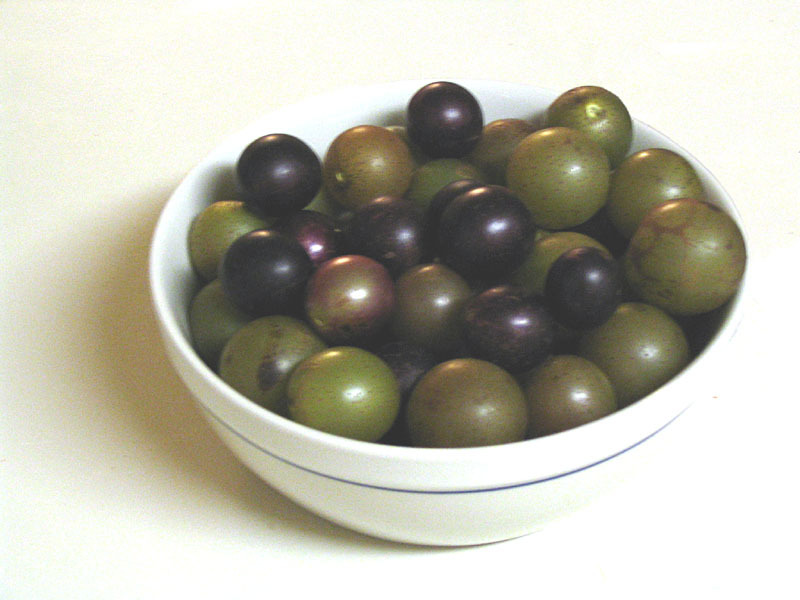 Scuppernong is a specific type of muscadine. They’re bigger than table grapes and have a tougher hull on them. From an early date wild varieties were crossed with grapes brought from Europe and the resulting product was neither fully wild nor possessing the identical traits of the tame. Bailey summed up the usual distinction between muscadines and scuppernongs according to color. 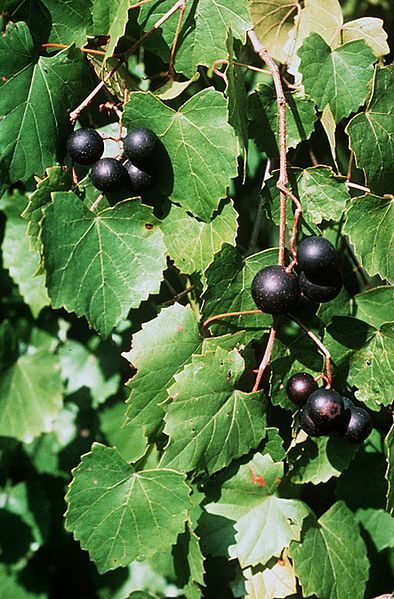 “The fruits [muscadine] are purple-black, except in the scuppernong, which is yellowish”. This is the distinction Southerners still make today. – Sketch of the Evolution of our Native Fruits. 1898. NY. Giovanni de Verrazzano, considered the first explorer to discover the region, recorded native grapes in his logbook while exploring the Cape Fear River Valley for France in 1524. “Many vines growing naturally there”, refers to the pure, unadulterated native plants before anyone began to cross them with European varieties. “Grapes of such greatness, yet wild, as France, Spain, nor Italy hath no greater”, was penned by Gov. Ralph Lane in 1585. In 1698, Hennepin’s account of North America included the notation that the land between New France and New Mexico produced wine made from wild grapes as good as any from Spain. His account tells us the wild vines grew off the ground, just as they did during my childhood. “…grapes as big as damask plums, we felled several trees to gather them…grapes are very big and sweet”. – Hennepin, Louis. A New Discovery of a Vast Country in America. 1698. London. Spooner acknowledged the French settlers in Illinois produced some one hundred ten hogsheads of strong wine from native grapes and tells us how settlers in Lower Louisiana (now Alabama) were encouraged to continue to improve upon that. “The government of the United States, desirous of encouraging the cultivation of the vine, and making of wine, made extensive grants of public lands for this patriotic service, to some of the distinguished exiles of France, who chose Greene County, Alabama…” – Spooner, Alden. The Cultivation of American Grape Vines. 1846. Brooklyn. Muscadine grapes are native to the southeastern coastal plain area of the United States. They thrive in most of the soils of this area, which extends from Virginia to Florida and along the Gulf coast to Texas. The distribution of the species extends also northward along the Mississippi River to Missouri and reaches well up into the Blue Ridge Mountains along the southeastern seaboard. The Europeans were slow to realize the value of native varieties, and the native species was crossed with European varieties in an attempt to encourage the best traits of each. Farmers around York and Lancaster, Pennsylvania were active in such grape culture in the early 1800’s. When colonization of America began the explorers returning to the Old Country carried glowing descriptions back with them of the bountiful yields of grapes to be found in the New World. These reports came from all parts of the North American continent, for the wild grape was found in almost every part. These sights suggested the vineyards of England and Europe with which the explorers were familiar. They thought of bringing their varieties of grapes to the colonies with them. Not once did they think of there being anything of value in the native American grapes. Not until the beginning of the eighteenth century did the colonies learn that the European grape could not be successfully grown in Eastern United States. Indeed it was not until the beginning of the nineteenth century that the native grapes of North America began to be cultivated. For decades previous to this date people had been content to gather the wild grapes which grew freely in the virgin forests. – PA Dept. Agriculture. Bulletin. No. 217. 1912. In 1913, the U.S. Bureau of Plant Industry reported that wild white grapes, called scuppernongs, had been recently located in Alabama, Florida, North Carolina, and South Carolina. The name was native in origin, and the white Rotundifolia was thought to have originated in northeastern North Carolina. Several sources claimed the original vine, discovered by Sir Walter Raleigh on Roanoke, still lived and bore fruit into the early 20th century, however, a government Bulletin discounted the theory saying it was admittedly very old, but not the 400 year old plant some claim it is. Some were reported that lived between 100 and 120 years. – Bulletin. No. 273. 1913. Washington. The scuppernong was said to be longest in cultivation of all the North American grapes in a 1938 Dept. of Agriculture Bulletin. “Although the place of origin cannot be stated positively, owing to the age of the variety, it has been pretty definitely established as being in Tyrrell County, N. C. before 1760”. Isaac Alexander went down in history, right or wrong, as having “discovered” it there in 1755. Bulletin No. 1785. There is much discussion in the journals of wine made from the scuppernong, but apparently nonalcoholic versions were also appreciated. The settlements are much more frequent, and almost every dwelling house has its adjacent arbor covered by one or more scuppernong vines, forming an object even at this early season a very pleasing to the eye, and which in summer must be as beautiful as profitable. It is very strange, that when the expressing the juice of this grape is done so generally, and to such great extent, in this part of the country, that no one attempts to make true wine from it, by proper fermentation. For though what is called Scuppernong wine, if of the best kind, is a delicious drink, it is not fermented liquor, nor does it indeed deserve to be called a wine. – Ruffin, Edmund. Farmer’s Register. April 30, 1840. As a child I looked forward to accompanying my parents and sometimes my grandfather into the back woods of his farm in Northwestern Alabama to gather wild muscadines which were made into delicious jelly. In thinking back on those treks through the great woods I can almost smell the rich fruity aroma that came with shaking the ripe muscadines from the vines and picking them up. The old farm is long gone, and so, unfortunately, are those wonderful muscadine vines. GRAPES, Ratafia of. Take some fine muscadine grapes, pick them from the stalks; bruise and press them, so as to extract all their juice; then dissolve some sugar in the grape juice, adding to it brandy and cinnamon; let the whole infuse for a fortnight; then strain it through a filtering bag, and bottle it off. The proportions are one pint of brandy, ten ounces of sugar to one pint of grape juice. – Dolby, Richard. The Cook’s Dictionary. 1830. London. CANNED SCUPPERNONG. One peck of scuppernongs, one quart of water, one quart of sugar. Press the seeds and pulps from the skin and put to cook in a granite vessel. Have the skins and water cooking in a larger vessel. When pulp is soft, strain from seeds and add to the sugar and skins. Boil all together twenty minutes and put in well sterilized jars, and seal at once. – First Presby. Church. The Florida Tropical Cook Book. 1912. Miami. SCUPPERNONG BUTTER. 1 qt. scuppernongs. 3 cups sugar. Cover scuppernongs with water and cook twenty minutes. Rub through a colander. Add sugar and cook twenty minutes, stirring frequently. – Atlanta Women’s Club Cookbook. 1921. Atlanta. SCUPPERNONG GRAPE JELLY. Wash and crush grapes. Add water in the proportion of 1 quart water to 4 pounds grapes. Cook from 20 to 30 minutes. Strain through cheese cloth and filter through flannel jelly bag. To 4 cups juice add 2 cups orange pectin and 4 ½ cups sugar. Cook to 223 degrees F., or 106 degrees C. Pour immediately into hot sterilized glasses. PIE FILLING. Excellent pie may be made from the fresh Muscadine grapes. Remove the seeds and soften the skins as in preparing the grapes for canning…Sweeten to taste, using about one cup of sugar to a pint of the combined pulps and skins. Put into a deep pie plate lined with crust, put on an upper crust and bake until brown. – Young, W. J. Products and Utilization of Muscadine Grapes. Bulletin 206. S. C. Agricultural Experiment Station. Nov. 1920. I previously posted a piece on the use of the term Irish potato, to describe potatoes of various shapes and colors, but distinctly different from sweet potatoes, and in line with my determining the frequency with which various foods may have been eaten at Ft. Toulouse between 1717 and 1765, we’ll now look at potatoes on the dining tables of the French. While potatoes were not much appreciated in France until after Ft. Toulouse was abandoned by the French, potatoes had been commonly eaten in the New World for a hundred years or more by then, and their use might well have encouraged the work of the man who singlehandedly brought about widespread use of the potato in France. In 1914, Neuilly, France celebrated the centenary of [Antoine-Augustin] Parmentier [1737-1813], “the man who in the days just preceding the revolution, made the potato familiar in France as an article of food”. At the commencement of the seven years war , Parmentier, a chemist apprentice, obtained a post in the French army, and while in Frankfort became acquainted with the properties of the potato. Later on he contributed an essay on vegetables capable of taking the place of bread, a subject for which a prize was offered by the Besancon Academy. Parmentier wrote of the potato and won the prize. – The Square Deal. Feb. 1914. Parmentier was an intelligent boy although his father’s premature death limited his early education to a slight knowledge of Latin which he learned at the hand of his mother. In 1755, he entered into an apprenticeship with an apothecary in his city of Birth, Montdidier. In 1756, he went to Paris to continue that business, living with a relation who had settled there previously. In 1757, he became the apothecary in the hospitals of the army of Hanover. “…when his duties fixed him in any town, he visited the manufactories least known in France, and requested permission to work in the laboratories of the most eminent chemists”. He made copious notes on the work of German farmers and on what he observed when following the army. His work on, “the number and power of resources which nature would present against so many scourges, if she was properly questioned and studied on the subject” would benefit greatly from his imprisonment during the war. Up to that time the French had ridiculous notions regarding the potato, one of which was that it caused leprosy, and generally avoided them like the black plague, however, Parmentier was imprisoned five times during the Seven Years War and was, “conveyed to places which he never would have otherwise visited; hence he learned, from his own experience, to what length the horrors of famine were sometimes carried, a course of instruction necessary perhaps to kindle in him that fire of humanity with which he was inflamed during the rest of his long life”. At the end of the war in 1763, he returned to the capital and resumed his studies. In 1766, after much struggle he obtained the position of apothecary in the Invalids which supplied him with the means with which to live while continuing more specific work which would eventually relieve a great deal of suffering. By 1772, he was chief apothecary, an appointment which came with its own set of problems. The Sisters of La Charité who administered the hospital, had tolerated him until he was promoted to that position and effectually placed on a level with them. After two years of constant harping, the king saw to it that Parmentier would, “retain all the emoluments of his office without discharging any of its duties”. Without intending it, the good Sisters made it possible for him to pursue his work at a feverish pace and uninterrupted. 1769 had been a time of scarcity in France, and the Academy of Bensacon offered a prize for the best paper on plants which would relieve such want. Parmentier knew several wild plants could provide much needed sustenance in times of scarcity, but they weren’t practical for culture. He remembered his time in German prisons when the only food available was potatoes and settled on the potato as the subject of his paper. Parmentier was a wise man and knew that a paper alone might easily be overlooked, so he set out to demonstrate the potato’s worth. He planted a field by the road-side and placed watchmen over it during the day to give the impression of great worth. As he hoped, the people viewed it as an item of great importance and entered the fields at night, took the potatoes, and began to see their worth. Realizing he must overcome the idea of the potato being a famine food for the poor in order for it to be totally accepted, he gave a lavish dinner for the wealthier class consisting of several dishes all made from potatoes. In 1778 he published a “Chemical Examination of the Potato” and was granted some land near the Bois de Boulogne on which to grow the plant. 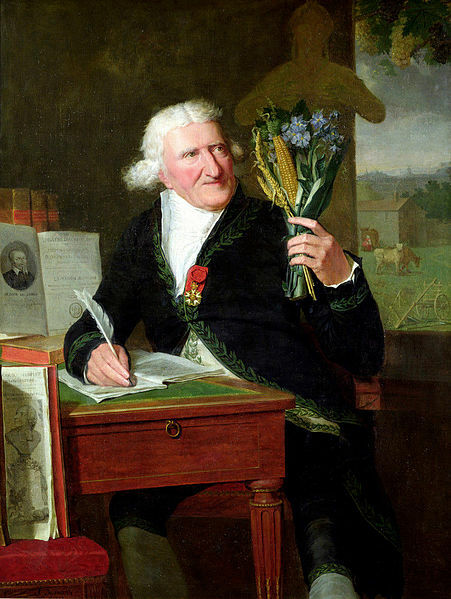 Regardless of the ridicule which the Parisians heaped upon him, Parmentier sowed his seed and when the little white flower appeared, he picked a bunch and presented it to Louis XVI. The King placed it in his buttonhole, and the favor of the court, if not of the city, was won. The seal was set to Parmentier’s labors and the potato finally admitted to the French menus when the chef of the King’s kitchens invented the “pomme soufflé,” a dish worthy of a royal table. – The Square Deal. Feb. 1914. His list of accomplishments is long. “He took an active part in recommending economical soups, he contributed greatly to the propagation of vaccination; it was chiefly he who produced, in the hospitals of Paris, that regularity which now prevails in the apothecary’s department; he superintended the great bakehouse where all the bread for the hospitals is baked…he paid the most scrupulous attention to every thing that could better the condition of 800 old persons of both sexes who fill it”. Few men live to achieve the respect that Parmentier did, however, being so intent upon his work cost him in his personal life. He never married, and lived many years with his sister, Madame Houzeau who supported his philanthropy. By the time Parmentier became affected with a chronic affectation of the chest, however, his sister had gone to her reward leaving him quite alone. He died on 17 Dec., 1813 at the age of 77. – Cuvier’s Eulogy, delivered at the Institute. Monthly Mag. June 1815, republished in the Encyclopaedia Londinesis, Or, Universal Dictionary of the Arts. Vol. 18. 1821. London. Thankfully, Parmentier lived to see his efforts at making the potato a complete success in one of the last countries to accept it a success. In one of his last books he wrote, “The potatoe has now none but friends, even in those districts from which the spirit of system and of contradiction seemed to have banished it for ever”. In his eulogy it was acknowledged that twice within the last 20 years prior to M. Parmentier’s death, that the potato had averted great horrors of famine and certain starvation of the French people. I researched “Irish potatoes” to see how early I could find the term in 18th century gardening treatises or cookery books after a fellow historian asked me how early I’d seen that exact term in print. The following may offer some insight into the use of it. 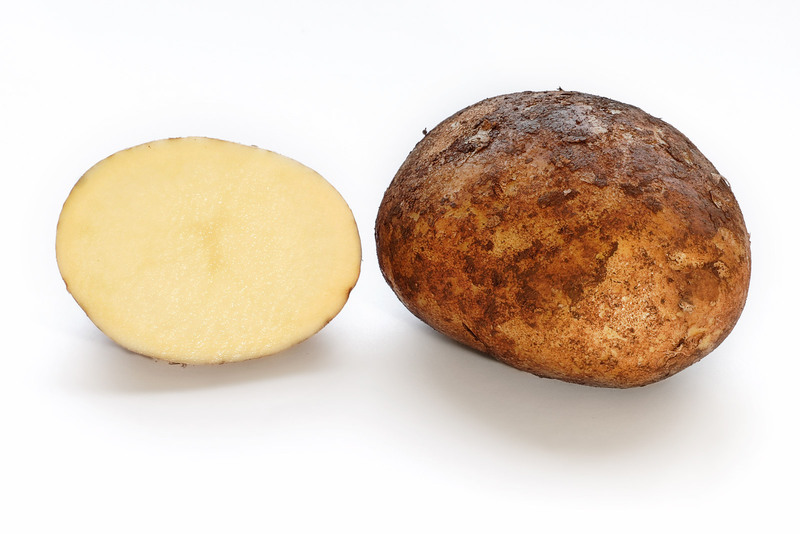 The term Irish potato can more than likely be explained by erroneous assumptions as to its origins because after being grown in Ireland for a while and then being circulated through other areas, still very early, some failed to note that it had been taken to Ireland and was not native to Ireland. The Boston Cooking School Magazine said as much, “It is called Irish potato generally in the United States to distinguish it from the sweet potato, and because it has become the chief food staple in Ireland”. That article went on to document the early acceptance of the potato in Germany and the recent discovery of an 8 foot tall monument in Germany which read, “Here in the year 1747 the first trials were made with the cultivation of the potato”. – Vol. 14. Oct. 1909. From 1710, I located a summary of potatoes, including the “English or Irish” potato. The Virginian potato, “grows wild not only in Virginia, but almost every where thro’ the whole Continent of Florida. The English or, “Irish Potato which grows in roots are sold by bushels in our London Markets.” – Salmon, William. Botanologia. 1710. He described the, “English or Irish Potato”, as roundish tuberous root sometimes smooth, some times knobby of various magnitudes from the smallness of a filbert, to bigger than a large fist doubled, it is solid, compact, and of one uniform substance, white within, and reddish without.” They were boiled in their jackets, peeled, and boiled again until the broth was as thick as heavy cream. Some put in milk, some broth. “the broth is made pleasant with sweet Butter, a little salt, and double refined Sugar, and so eaten”. Ambrose Phillips compiled a collection of old ballads which was published in London in 1723. In A Dialogue Between Morgan, Sawney, and Teague on the 19th of October, 1714, on the Eve of his Majesty’s Coronation, are found the words, “With Irish Potatoes, good Mustard and Honey, Which I’ll buy without e’er a Penny of Money”. “…in the same manner as solanum tuberosum, called Irish potatoes…” began a discourse by William Douglas. – Douglass, William. A Summary, Historical and Political of the First Planting , Progressive Improvements, and Present State of the British Settlements in North-America. 1755. Le Page du Pratz wrote of sweet potatoes in Lower Louisiana which he compared to, “Topinambous (Irish potatoes).” – The History of Louisiana, Or the Western Parts of Virginia and Carolina. 1774. London. I remember, about twenty-five years ago, the large red potato, then called the Castonian…as also the oblong Spanish white potato, to be chiefly in use; but now a lesser sort, such as the Munster or kidney potato, of a whitish or lightish yellow colour, the leathercoat, or round red Cronian potato, with a rough thick skin and particularly that stiled [sic] the Spanish white potato, are mostly in use. – The Royal Society of Arts. Museum Rusticum. 1757. London. Continued……..See The French and Their Acceptance of the Potato©. Ft. Toulouse was a French fort located in the Creek nation at the confluence of the Coosa and Tallapoosa Rivers in Lower Louisiana and functioned from 1717 until the French left the area after the French and Indian war. There were numerous Indian towns in the area, but other than the French soldiers, their families, and a few traders there were very few whites in the area. The married marines had farmsteads and gardens and they traded with the Indians for a number of things. All things considered the class of people sent from France to populate Louisiana, probably fared better than their counterparts who remained in France. Goods were shipped up from Mobile and New Orleans and down from Illinois on the rivers and there was a land route from the gulf. This post will take a brief look at goods coming into Lower Louisiana. The Illinois country is one of the finest in the world; it supplies all the lower parts of Louisiana with flower [sic]. Its commerce consists in furs, lead and salt. There are many salt springs that attract the wild oxen, and the roe-bucks, which like the pastures around them very much. Their flesh and tongues are salted, and furnish another branch of commerce to New Orleans; and they cure hams, which equal those of Bayonne. The fruits are as fine as in France. – Bossu, M. Travels through that part of North America Formerly called Louisiana. Vol. I. London. Salt was as important for preserving food as for seasoning it so having it brought down river was important trade for the inland parts of Lower Louisiana. The Indians were frequently seen in the area because of the salt springs and salt rivulets, “with which it abounds, particularly in the neighborhood of Fort du Quesne”. – Smollett, Tobias. The Critical Review. 1758. London. Wheat grew better in Illinois than it did in lower Louisiana so there are several accounts of quantities of flour being shipped down river. Du Pratz wrote that wheat, rye, and other grain grew well there and that when flour from France was scarce they shipped down to New Orleans, “upwards of eight hundred thousand weight thereof in one winter”. Wheat didn’t do as well in Lower Louisiana so much of the bread eaten in that area was made from cornmeal. A small amount of flour was received from France, but most of what was available came from the Illinois area. “In the late wars, New Orleans and the lower parts of Louisiana were supplied with flour, beer, wines, hams and other provisions from this country”. – Pittman, Phillip. The Present State of the European Settlements on the Mississippi. 1770. London. Du Pratz noted that the French colonists exported to the islands native Appalachean beans, maize, red peas, and cleaned rice, returning with sugar, coffee, rum, etc. – Du Pratz, Le Page. The History of Louisiana and the Western Parts of Virginia and Carolina. London. 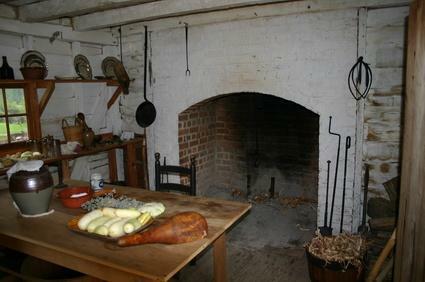 The following is a list of common ingredients used in preparing foods during the 18th century with insight into how the items became available between 1717 and 1765 in Lower Louisiana. Combined with locally harvested fruits, vegetables, fish, domestic animals, and wild game French women at Ft. Toulouse could have made almost anything any other 18th century woman could, and probably much more than they could have in France unless they were wealthy. Not all ingredients were available at all times. Availability of anything not produced locally depended on sporadic shipments from France or traders who brought in whatever items they thought would yield a profit, and what a woman could make during the winter depended on how prudent she’d been in preserving her bounty during the summer and fall. It was crucial that supplies were stored so that vermin couldn’t get to them. Lastly, kitchen gardens needed water to grow and during a hot dry summer watering by hand meant carrying the water in a bucket. Chickens were valued more for eggs than flesh, but hens don’t lay year round. Cows and goats were valued more for the dairy products, but they don’t produce milk year round. Sheep provided fleece which was used to make warm woolen garments so roasted lamb meant less wool for clothing. Vegetables and fruits are seasonal so unless pickled, dried, or preserved with sugar there were no pies or puddings except for the few weeks they could be picked. Having nuts for winter baking meant gathering them and storing them before the squirrels ate them. COFFEE. Trade. Various substitutes were produced. CORN MEAL. Produced from locally grown corn. VINEGAR. Produced from any of the many fruits grown in the area. DAIRY: Cream, Milk, Cheese, Butter: Produced from the many cows in the area. EGGS: Produced from chickens, ducks, and geese brought from Europe. HERBS: (Parsley, Basil, Rosemary, Marjoram, Savory, Tarragon, Chervil, Dill, Sage, Chives, Fennel, Lavender, Mint, Oregano, Rue, Thyme) Produced, grown in gardens. MOLASSES. Primary sweetener in 18th century. Traded. RICE. Produced, and traded as well. CITRUS. Grown in Lower Louisiana, probably traded as well. SPICES. Trade, including trade from the French West Indies. SOAP. Produced, to a lesser degree traded. NUTS. Produced, harvested in various areas. SALT. Produced, and to a smaller degree traded. CHOCOLATE. Traded, including trade from the French West Indies. YEAST. Produced – from hops, potatoes, etc. ANCHOVIES: Traded. Sometimes a substitute was made from any other small fish and pickled. This post is from research I’m doing for the historic foodways program at Ft. Toulouse, Lower Louisiana, today Wetumpka, AL. I’ll be doing a series of posts on what was available in the first half of the 18th century and how it got there. Source: The History of Louisiana: Or of the Western Parts of Virginia and Carolina…Le Page du Pratz. 1776. London. Louisiana produces several kinds of Maiz, namely Flour-maiz, which is white, with a flat and shriveled surface, and is the softest of all the kinds; Homony corn, which is round, hard, and shining; of this there are four sorts, the white, the yellow, the red, and the blue; the Maiz of these two last colours is more common in the high lands than in the Lower Louisiana. We have besides small corn, or small Maiz, so called because it is smaller than the other kinds. New settlers sow this corn upon their first arrival, in order to have whereon to subsist as soon as possible; for it rises very fast, and ripens in so short a time, that from the same field they may have two crops of it in one year. Besides this, it has the advantage of being more agreeable to the taste than the large kind. 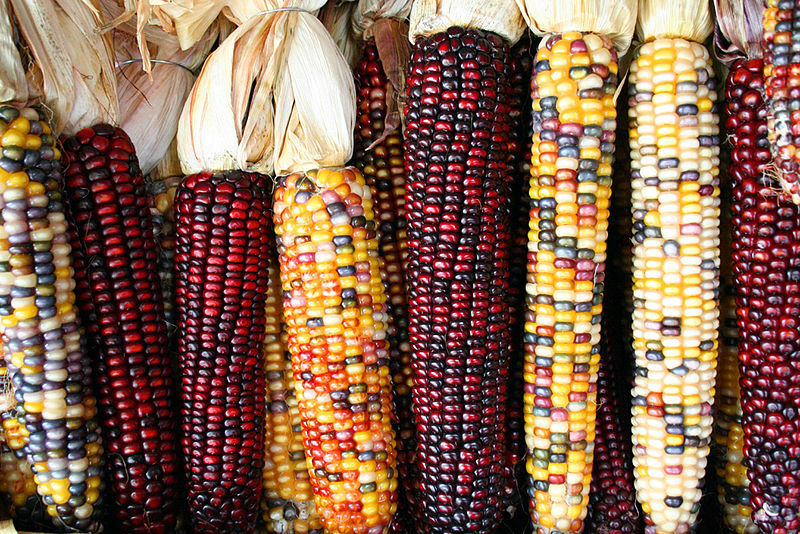 Maiz, which in France is called Turkey Corn, (and in England Indian Corn) is the natural product of this country; for upon our arrival we found it cultivated by the natives. It grows upon a stalk six, seven, or eight feet high; the ear is large, and about two inches diameter, containing sometimes seven hundred grains and upwards; and each stalk bears sometimes six or seven ears, according to the goodness of the ground. .. This corn, it is well known, is very wholesome both for man and other animals, especially for poultry. The natives, that they may have change of dishes, dress it in various ways. The best is to make it into what is called Parched Meal…As there is nobody who does not eat of this with pleasure, even though not very hungry, I will give the manner of preparing it, that our provinces of France, which reap this grain, may draw the same advantage from it. The corn is first parboiled in water; then drained and well dried. When it is perfectly dry, it is then roasted in a plate made for that purpose, ashes being mixed with it to hinder it from burning; and they keep continually stirring it, that it may take only the red colour which they want. When it has taken that colour, they remove the ashes, rub it well, and then put it in a mortar with the ashes of dried stalks of kidney beans, and a little water; they then beat it gently, which quickly breaks the husk, and turns the whole into meal. This meal, after being pounded, is dried in the sun, and after this last operation it may be carried any where, and will keep six months, if care be taken from time to time to expose it to the sun. When they want to eat of it, they mix in a vessel two thirds water with one third meal, and in a few minutes the mixture swells greatly in bulk, and is fit to eat. It is a very nourishing food, and is an excellent provision for travelers, and those who go to any distance to trade. This parched meal, mixed with milk and a little sugar, may be served up at the best tables. When mixed with milk-chocolate it makes a very lasting nourishment. From Maiz they make a strong and agreeable beer; and they likewise distil brandy from it. 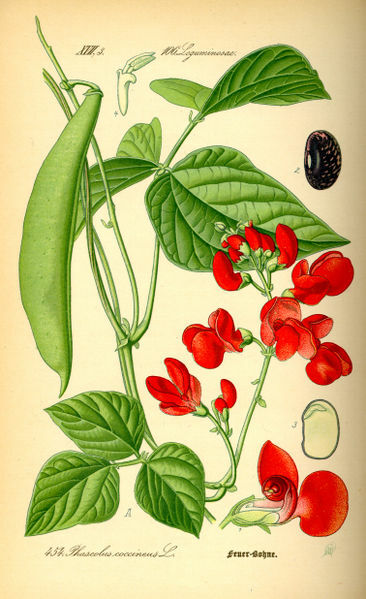 The first settlers found in the country French-beans of various colors, particularly red and black, and they have been called beans of forty days, because they require no longer time to grow and to be fit to eat green. The Apalachean beans are so called because we received them from a nation of the natives of that name. They probably had them from the English of Carolina, whither they had been brought from Guinea. Their stalks spread upon the ground to the length of four or five feet. They are like the other beans, but much smaller, and of a brown colour, having a black ring round the eye, by which they are joined to the shell. These beans boil tender, and have a tolerable relish, but they are sweetish and somewhat insipid. The potatoes are roots more commonly long than thick; their form is various, and their fine skin is like that of the Topinambous (Irish Potatoes.) In their substance and taste they very much resemble sweet chestnuts. 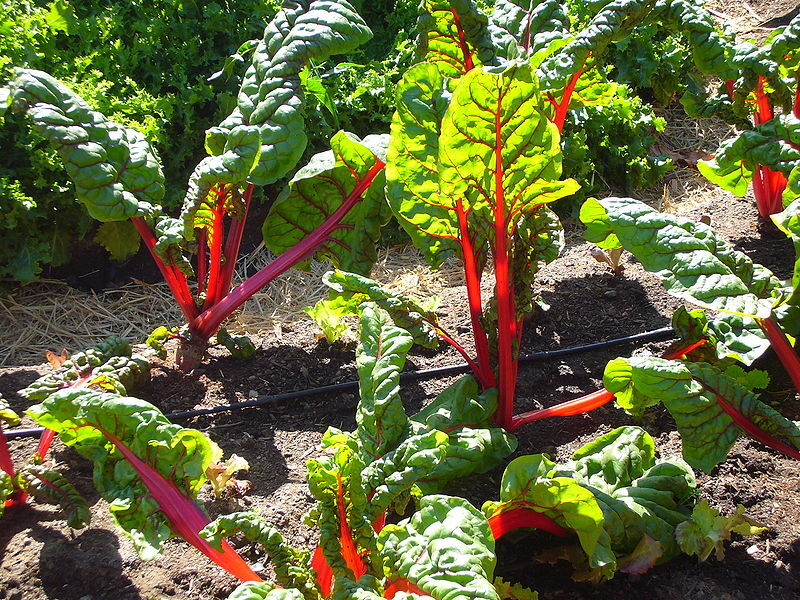 They are cultivated in the following manner; the earth is raised in little hills or high furrows about a foot and a half broad that by draining the moisture, the roots may have a better relish. The small potatoes being cut in little pieces with an eye in each, four or five of those pieces are planted on the head of the hills. In a short time they push out shoots, and these shoots being cut off about the middle of August within seven or eight inches of the ground, are planted double, cross-ways, in the crown of other hills. The roots of the last are the most esteemed, not only on account of their fine relish, but because they are easier kept during the winter. In order to preserve them during that season, they dry them in the sun as soon as they are dug up, and then lay them up in a close and dry place, covering them first with ashes, over which they lay dry mould. They boil them, bake them, or roast them on hot coals like chestnuts; but they have the finest relish when baked or roasted. They are eat dry, or cut into small slices in milk without sugar, for they are sweet of themselves. Good sweetmeats are also made of them, and some Frenchmen have drawn brandy from them. The cushaws are a kind of pompion. There are two sorts of them, the one round, and the other in the shape of a hunting horn. These last are the best being of a more firm substance, which makes them keep much better than the others; their sweetness is not so insipid, and they have fewer seeds. They make sweetmeats of these last, and use both kinds in soup; they make fritters of them, fry them, bake them, and roast them on the coals, and in all ways of cooking they are good and palatable. All kinds of greens and roots which have been brought from Europe into that colony succeed better there than in France, provided they be planted in a soil suited to them; for it is certainly absurd to think that onions and other bulbous plants should thrive there in a soft and watery soil, when every where else they require a light and dry earth.